Wilhelm Balthasar was born on 2 February 1914 at Fulda in Hessen. He served in an Artillery Regiment from 1933 but transferred as a Leutnant to the Luftwaffe in 1935.  In November 1936, Balthasar joined the Condor Legion serving with the Aufklärerkette of Kampfgruppe K/88. He gained his first victory of the Spanish Civil War when, while on a reconnaisance mission, he shot down a Republican I-16 on 20 January 1937. On 15 March 1937, he joined Aufklärungsgruppe A/88 flying He 112s. He joined Jagdgruppe J/88 in September 1937. He gained a futher six victories with this unit including four SB-2 bombers shot down in one mission on 7 February 1938. He returned to Germany on 23 March 1938. In the 17 months he served in Spain, Balthasar had flown 465 combat missions. He was awarded the Spanienkreuz in Gold mit Schwertern und Brillanten in recognition of his feats there. At the beginning of World War 2, Balthasar was Staffelkapitän of 1./JG 1 and participated in the invasion of Poland. With the Blitzkreig of the low-countries and France, Balthasar was soon making his mark shooting down three Belgian Gladiator biplane fighters and a French Morane fighter on 11 May 1940. He claimed five French victims on 5 June, to record his 20th through 24th victories, and claimed a further four on 6 June (25-28). On 14 June, Hauptmann Balthasar was awarded the Ritterkreuz, only the second fighter pilot, behind Werner Mölders (115 victories, RK-Br, killed in flying accident 22 November 1941), to be so rewarded. In addition, he claimed 13 aircraft destroyed on the ground. He was considered the most successful German fighter pilot of the French campaign. On 5 July, 1./JG 1 was renamed 7./JG 27. On 1 September 1940, Balthasar was appointed Gruppenkommandeur of III./JG 3. On 4 September, he was seriously wounded in leg over Canterbury in England in aerial combat with Spitfire fighters from 222 Squadron RAF. Despite the severity of his wounds, Balthasar was flying operationally 14 days later. On 23 September he shot down two Spitfires with only 88 bullets from cannons and MG`s. He claimed a further three victories before having to submit to hospital treatment for his wounds in November. Geschwaderkommodore of JG 2 "Richthofen" Hauptmann Wilhelm Balthasar in his Bf 109. Early 1941. 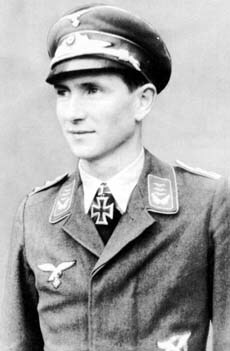 Major Balthasar was appointed Kommodore of JG 2 on 16 February 1941. Between 22 June and 27 June, he shot down nine enemy aircraft, including five RAF Blenheim twin-engine bombers on 23 June (32-40). He was awarded the Eichenlaub (Nr 17) for 40 victories on 2 July. 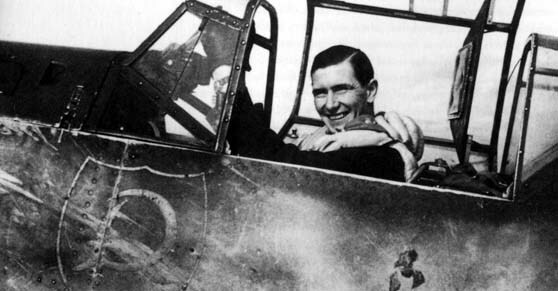 On 3 July 1941, Balthasar killed in aerial combat with RAF fighters near Aire, France. When Baltasar attempted to disengage from combat in Bf 109 F-4 (W.Nr. 7066) by diving, a wing of his aircraft folded and he crashed to his death southeast of St Omer. He was posthumously promoted to the rank of Major and buried in a World War 1 cemetary in Flanders alongside his father, who had fallen in the earlier conflict. Wilhelm Balthasar was credited with 47 victories. In 1939-41 he flew about 300 combat missions. Seven of his victories were recorded during the Spanish Civil War.